It tells me that the applicable marginal tax rates for earned income has come down for high income recipients while it has stayed the same for middle income recipents. It also tells me that capital gains tax rates which apply disproportionately to persons in the high income brackets have also came down significantly since the late eighties. My conclusion…it tells me that wealthly taxpayers seem to have received substantially all of the benefit of tax policy changes over the last two decades. Fancy that. 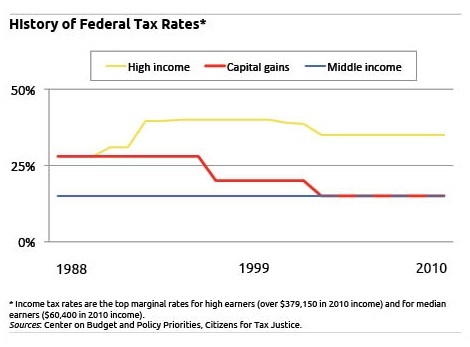 The chart showing low taxes for rich people taking income in the form of capital gains shows who controls the federal government. To understand who controls New York State government, understand this. Public employee pension income is exempt from state income taxes no matter how high it is, and no matter how high total income is, at any age. New York City has relatively low residential property taxes for New York State, but also has a local income tax on top of the state and federal income taxes. Public employee pension income is exempt from that too. The first $20,000 of private pension income is exempt from taxes too, but only after age 59 1/2 (recently reduced). Social Security is exempt as well. A retired public employee with $100,000 in retirement income would pay no taxes state and local income taxes in New York. A working parent with an income of $50,000 would pay quite a bit. Pensions have been repeatedly retroactively enhanced for public employees over the past 15 years. Over the past 30 most private sector workers have lost retirement benefits, and more recently cash wages have been falling for all but the (other) rich. Here is one of a series of detailed analyses for taxes in NY. A similar analysis could be done for Mass. There is nothing wrong with public policies that redistribute well being to the old from the young, who have other advantages, as long as these are sustainable. That is, as long as those now old were willing to make similar sacrifices when young, and those now young can expect similar benefits when old without wrecking the country. But that is not the case. Those now over 55 collectively voted for \tax cuts\ at the federal level at every opportunity for 30 years. But they only want the \small government\ that goes with it for those age 54 and under. And it is the case that those who already had the best retirement benefits, public employees, took more, even as those less well off have been left even worse off to pay for it. And that the cost of the increased retirement benefits, if it was disclosed at all, was described as zero.